For those that have never been to Antigua you may find it interesting to know that Antigua was discovered by Christopher Columbus in 1493 and was a British Colony up until its independence in 1981. In the late 1600’s it was discovered that the island could become another Caribbean source of sugar. There are still remnants of the old sugar mills that still stand on the island today. 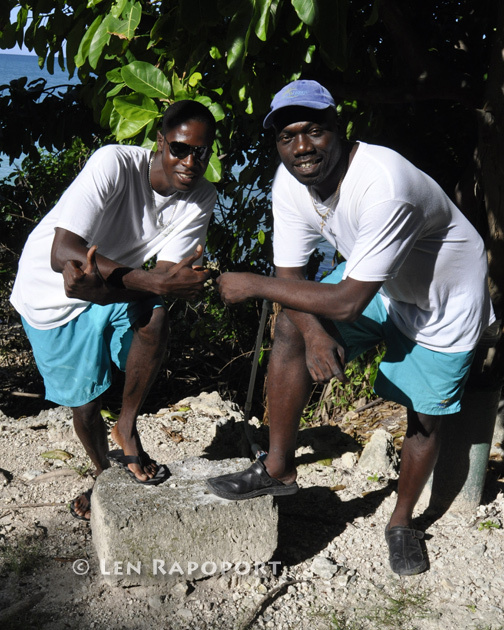 Most Antiguan’s are of African lineage and are descendants of the many slaves brought to the island centuries ago to work in the sugarcane fields. There are daily flights coming into the island from the United States, the United Kingdom and other countries and the Antiguan’s speak English, which is the countries principle language and their currency is the East Carribean dollar. At this writing the US dollar was worth 2.7 Carribean dollars or the Carribean dollar was only worth 37¢ U.S. U.S. currency is accepted in most places on the island and it is a good idea to bring a stack of dollar bills with you for gratuities and small items you may wish to purchase. St. John’s, the capital and largest city in Antigua is a tourist attraction to many that want to get a feel for the culture and people of this beautiful island. Our trip was to take us to Antigua and the beautiful award winning Blue Waters Hotel. Although Blue Waters, began as a family owned 16 room guesthouse over the past fifty years it has become a resort complex which includes the Blue Waters Hotel, the Cove Suites and the Blue Waters Villas, 6 buy-to-let luxury villas that are currently under construction. Blue Waters is located on the northeast corner of the island at Soldier’s Bay, in what, I believe is one of the most calming and beautiful places I have seen in years. For the past twenty five years it has been owned by the Randall family. Mr. R. Randall is the majority shareholder of both Blue Waters Hotel and Randall Parker Food Group, a UK incorporated company that was rated in the 2006 Top Track 250 league table as Britain’s 67th largest mid-market private company. The Blue Waters complex has a total of 100 rooms and suites with three restaurants, a well maintained 17 acres of lush tropical gardens, a number of intimate private beach coves, three main pools and four additional pools at the Cove Suites, one pool for each building. They also have a full water sports and activities center. This is the type of resort one goes to when they want to simply relax, sit at the pool or on the beach and sip their favorite drinks. Blue Waters is certainly not the type of resort you would go to if you prefer a colossal ship or a super hotel. If you love the mammoth resorts full of activities and lots of food to eat this would not be for you either. Not all vacations should be the same and some vacations can be those where you may visit a new country or one that offers activities or sports, theme parks, attractions. But, at times we all need to understand the importance of a vacation that offers time to simply relax and restore ones body and soul. Many of us have thoughts of being on a gorgeous tropical island while enjoying the splendor of the islands natural beauty. How often do you dream of a vacation where you can simply sit on a beach or on a comfortable chase lounge, around a beautiful pool? Some people are so frustrated that they can’t sleep at night or unwind from a stressful day. They will toss and turn in bed and some may even try to fall asleep by listening to the sounds of a wave machine. Well you can actually go to sleep on one of the most comfortable, luxurious beds, listening to real waves, while being serenaded by the sounds of frogs croaking in the night at Blue Waters. The relaxing tropical island vacations take us away from our daily routines. It is the one vacation that allows us to escape the daily stress in our lives and one that will recharge and help us regain our strength and energy. You will find that at Blue Waters, a resort that understands the challenges, will deliver the kind of vacation that will relieve you of that stress and invigorate you. Being a photojournalist who specializes in travel, I find that even when I plan a relaxing cruise or vacation, it is never quite as relaxing as planned. I know I need to write a review, take photos and videos that will display the property properly, so I am always on assignment even when I am on vacation, it is just the way it is. Luckily for me, I was still able to enjoy a truly relaxing and wonderful five days at Blue Waters and still feel no guilt as I shot my photos of their magnificent property and met with the many friendly staff members and guests at the hotel which you will see in our video. 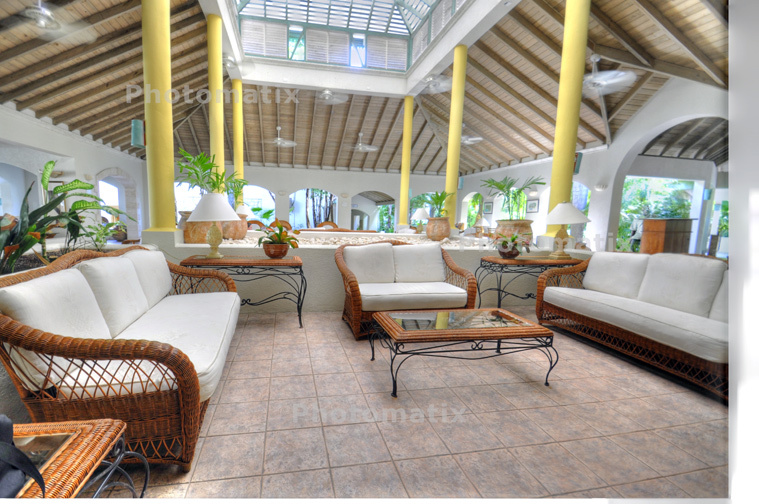 The beautiful lobby is decorated in traditional Caribbean style. There are a number of airlines that fly into Antigua. From the United States you have flights by American Airlines, Continental, US Airways and Delta and international flights we found Virgin Airlines, British Airways, Air Canada and others. Antigua’s airport is small and and only has a few inbound flights each day. On arrival you will first clear their customs, proceed to the taxi stand, and arrange for your taxi to take you to Blue Waters and a cost of only $13 per couple (possibly for your entire family, I am not sure). Blue Waters was only four miles from the airport and only takes ten to fifteen minutes to reach the hotel. On arrival at the hotel you will be met by one of their staff who will offer you an iced wet towel to cool you down and a welcome cocktail. Their lobby was beautifully maintained and was furnished in the true Caribbean motif one would expect for a Caribbean destination. Now remember, Blue Waters is not the Atlantis Hotel with the football field sized lobbies, it is a charming, warm and friendly, family owned hotel and you sense that on your first few minutes there. All Inclusive or À la carte? We are always asked if it is wise to book some resorts and take their inclusive package or simply go À la carte. I think it depends on you and how much you drink or like to eat. If you are the type that tends to overeat on cruises and at the many all-you-can-eat resorts, or if you love to have exotic drinks, beer or sodas at the poolside or at your meals then you just may want the Blue Waters inclusive plan. Many people prefer this because they usually pay for the plan with their vacation package months before their vacations begins. When they finally go on their vacation or honeymoon, they don’t have to deal with the cost of every drink or look at the prices on the menu’s. I know I prefer to take the inclusive plans when I travel to most resorts and I only drink diet Coke although my wife does enjoy a glass of wine at dinner. I am the type of person that simply can’t enjoy myself if I have to look at a menu and decide what I am going to order based on the cost as so many people do. Now if you are not on their meal plan, you may wish you were. The cost of a couple of burgers and glasses of wine and a side dish or two at dinner, can easily cost you $100 USD or more, the same as it would at a fine restaurant. We met some honeymooners that told us they didn’t drink and only ate a light lunch and dinner and didn’t think the all inclusive meal plan would work out for them, and it might not have. But we did notice that they didn’t order the fresh fish at dinner or have the desserts and we knew when we saw the hamburgers being served at their table, that they were concerned about the costs. Being on the inclusive plan also includes your use of their water sports facilities and that means the paddle boats, the Hobie’s, the snorkeling gear and other activities they offer. If you have a good travel agent, they may be able to find a great package deal for you that will keep you on budget and give you the best plan and the most reasonable prices. The internet is great, but use that as your starting point only and then contact a reputable travel agent and see if they can meet or beat your best price. In many cases they deal with tour operators that can put a great package together for you at a better price then a web site and you can get some good advice and recommendations that enables you to make an intelligent decision. 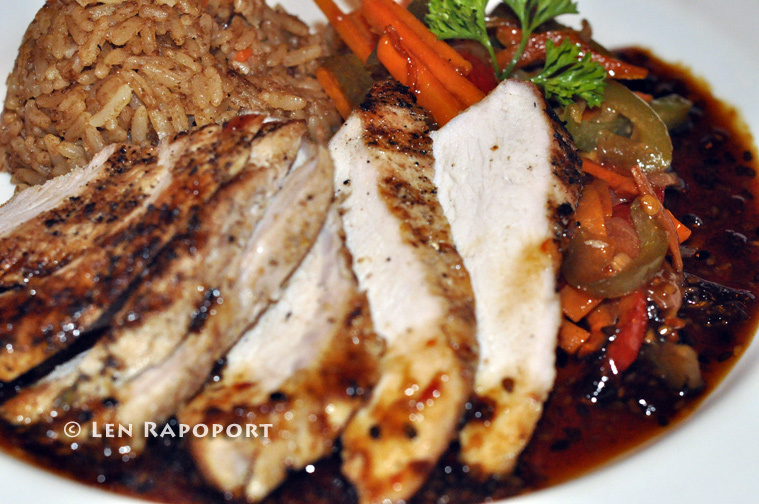 The food we found at all of the three restaurants was excellent in quality, taste, freshness and presentation. Remember, if you are used to a cruise or the Club Med type resort and expect a grand buffet, or mountains of food available all day, every day you may be disappointed. If however, you are the type of person that enjoys going to a fine restaurant from time to time or you go on a cruise and dine in their specialty restaurants and don’t mind paying an extra $25 per person for the privilege, plus drinks and tip, then you will understand the Blue Waters experience. We found that we prefer not to fill up on food that offers no nutrition and loads of calories and then feel guilty when we return home. For us and the many guests we met, a simple egg white omelet, some yogurt, a fresh fruit plate and a glass of tea and juice is just fine for breakfast. For those that have a bigger appetite, they did have the pounds of bacon, breakfast sausage and pancakes too. There was the breads, cereals, hot and cold and some other choices on their menu and certainly enough to get you ready for a day of activities or shear relaxation. Lunch was also quite nice with either freshly barbecued chicken, burgers, franks or steak and or a visit to their buffet where you could prepare your own salads. I loved their tuna fish salad and made a great tuna wrap one day filled with some fresh fruit and nuts with a small salad on the side. Of course you can also order from their menu which offered the lunch staples, hamburgers, steak wraps (was one of my fav’s) freshly caught grilled tuna or fish of the day, pizza to name a few of their selections. There was enough choice to satisfy even the most particular diner, like me. For dinner you have a choice of dinning at one of their three restaurants. The Palm is their main and largest restaurant and you can eat in or out on the terrace. 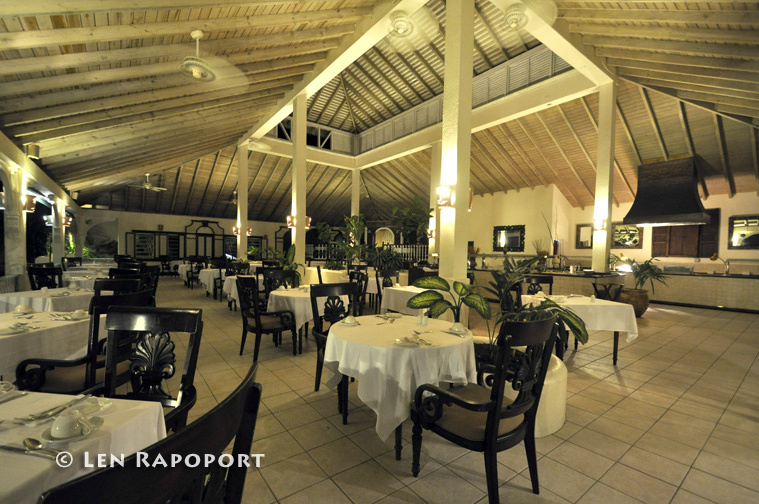 It is open on two sides and it is a lovely place at night with a beautiful view of the Caribbean Sea. Unlike many tropical destinations, the evenings here were wonderful with cool breezes and a native serenade from their Caribbean frogs that remind you, that you have left the big city and are now in paradise. Evelyn’s served mouth watering dishes, one of many we enjoyed. off season and not very busy, we had a choice of dining at the Palm and either Vyvien’s (one of the only air conditioned restaurants in Antigua) or the Cove Restaurant. Both of these restaurants took turns being open on any given night. So we dined at Vyvien’s one night and then the Cove Restaurant or the Palm on the other nights. All of these restaurants offered a wonderful selection of freshly caught fish (the fresh snapper and swordfish were to die for), duck, pork or steaks. At all of the restaurants they treat you to their wonderfully prepared soups. I can still taste the incredible tomato soup I had one night and a mushroom soup on another evening, the soups were truly superb. The desserts was also quite good and the service at all of the restaurants was excellent. I think you will enjoy dining in their warm and intimate restaurants as we did, a welcome change from the many crowded, noisy restaurants we have become accustomed to on other vacations or at home. After dinner we all congregated at the typically Caribbean Pelican Bar. It is bright and airy with arched doorways that open onto their lush green gardens and adjacent to the tea terrace and lobby. During the day and on some of the evenings they provided music both Caribbean and contemporary by a Caribbean band, very nice indeed. To view their menu’s click here. The Deluxe Beachfront rooms should really be called the Deluxe Water View rooms because some might think that a beach front room means that you simply open your door and you are on the beach, which you are not. The windows from your room overlook Soldier’s Bay and it is a magnificent view, but you will have to walk to the beach which is a short walk from your room. As you can see in our slide show/video the rooms were quite nice and the bathrooms had a tub and stall shower. They also have Hillside View rooms, but these were being renovated while we were there, so we didn’t see them. We understand they are similar to the “beachfront” rooms, with a different view of the gardens and some even have a view of the sea. 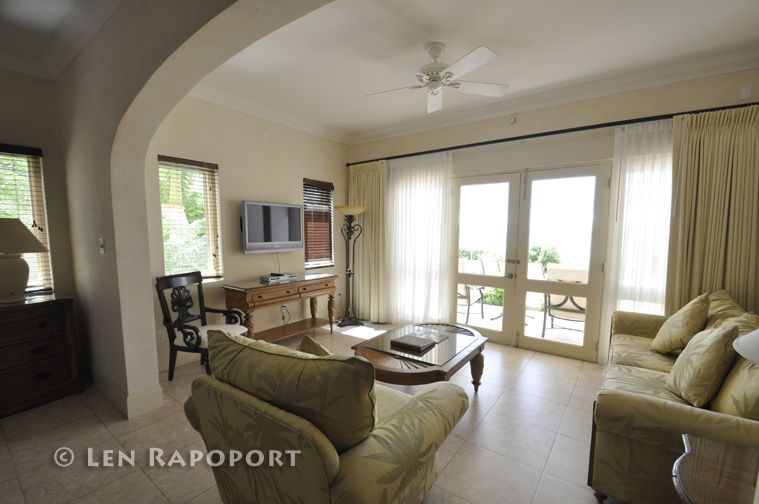 The main property’s Luxury Villas were quite nice and were decorated in a traditional Caribbean style. The luxury villas are also a good choice for a couple with a child or two children who prefer to be together or for those that like to have a living room and a bit more room area. The suite has a nice bedroom and a bathroom and we thought the the stand out feature is the patio where you can sit and watch the sun go down and even dine if you want in a more intimate and private setting. We felt the Luxury Villa we saw and possibly their others, could use a bit of upgrading. They need to replace their small, flat screen televisions with newer and larger ones and their bathrooms need some work as well, especially the bathtubs that were so high it was difficult to step in and turn on the shower. We tend to be a bit picky about the details and have high expectations when we stay in what is billed as a Luxury Villa. The Cove Suites was our choice. Combines modern with classic Caribbean styles. The Cove Suites, was our choice for a truly upscale stay at Blue Waters. We simply loved the suites and would recommend them for anyone that enjoys a modern suite with a modern bathroom that boasts a clear glass enclosed shower with rain forest shower head, a nice bathtub, two sinks and sliding doors that open into the bedroom. They also have a nice living room area with doors that open onto the buldings beautiful patio with its private pool. The pools at each building are shared by the seven suites in each unit. We found that they were empty most of the time, as suite guests went to the main hotel pools or the beach. There are many views of the Cove Suites in my video, including some very nice evening and beautiful sunset shots I was able to capture. You will also see a spacious penthouse suite with a spectacular view of the entire Cove Suites complex. There are four units that make up the Cove Suites. Each building or unit has 7 suites ranging in size from a one bedroom up to a 3 bedroom penthouse suite. The Cove Restaurant is situated in the heart of the Cove Suites complex. Everyone we met that stayed at the suites, simply loved it. Getting to the main hotel is a short walk from the Cove Suites and if you are tired, and don’t feel like taking the walk through the beautiful gardens, you can simply ask one of their staff to either pick you up or take you to your suite in their golf carts. If you are planning a trip to Blue Waters be sure to find out more about the suites, it just might be what you want and can afford. The Rock Cottage has been voted the “Best Waterfront Villa In The World” by Harper’s and Queen Magazine (UK). You can read about this amazing villa which has hosted many family reunions, couples retreats or, as they put it, where their “high profile guests” might stay. Maximum occupancy in the villa is nine adults and three children and it includes two master bedrooms with luxury bathrooms and two double showers, vanity basin, and bidet; two additional bedrooms with en suite bathroom; and a small bedroom with queen-sized bed and en-suite shower room suitable for children, young adults, or accompanying staff. I had an opportunity to get a private tour of the Villa and was able to take some wonderful images of the separate living area, kitchen, and a plunge pool that overlooks the secluded beach nearby. For those that want to see the island either by land or sea, there are a number of options. You can hire a private car to take you on your own tour of the island or book one of the many tours available. The hotel can arrange golf, sailboat excursions, horseback riding, parasailing, helicopter tours, and visits to area restaurants or casinos. Some of the guests we met wanted to shop in St. John’s or see Nelson’s Dockyard National Park andShirley Heights some of the historic spots on the island. Others preferred to stay on-site and enjoy the hotels activities which include an all-weather tennis court, air-conditioned fitness center, a beauty salon and spa, and a games room. We used the fitness center which was nicely equipped with modern treadmills and workout equipment. Of course Blue Waters has a great bunch of guys at the Water Sports center and you can see these very cool guys in the video. They were full of fun and loved to pose for me and the camera. We decided to try the paddle boats and after peddling with all of our strength and going in circles a number of times, we decided to go back and sign up for some snorkeling the following day. We spoke to other guests who loved sailing on one of the Hobie’s, while others booked a cruise on one of the larger sailboats and went snorkeling. We are a bit older and preferred a less active vacation, so for us it was all about taking my photos and relaxing on their beautiful deck that is part of the infinity pool and actually extends into the water so you are sitting on top of the water which offers you an unparalleled view of either the pool or the Caribbean. You can see the many photos I shot from that deck. The management and staff at Blue Waters is simply the best. The general manager Alistair Forrest, the deputy GM Daniel Brown and their Marketing Manager Stephanie Mack made our stay exceptional and we noticed, it wasn’t just us, it was the same treatment to all the guests we met. As Mr. Forrest explained to us, “one bad recommendation on a travel web site can truly hurt a smaller resort” and their entire staff understands the importance of providing the best services and the creation of a friendly atmosphere for all of their guests. We found they just go out of their way to make sure everyone is satisfied and happy when they stay with them. It is nice to know that their are still places on this planet that truly appreciate your business and prove it. Look at the handsome, happy staff in our video and you will understand that their team is truly happy to serve you while you are their guests. Blue Waters is one of the better, moderately priced, upscale resorts that we have been to in many years. We have given it our four star rating which is one of the highest we rate resorts of this type. The food is exceptional, the management and staff accommodating and friendly and the accommodations met our standards of excellence with the one exception, the luxury villa. Blue Waters is the perfect honeymoon choice and Antigua is one of the hidden gems in the Caribbean. It has not been overrun with huge resorts, still retains the Caribbean. traditions and charm and the people are, well, simply wonderful. We found Antigua one place that we would describe as a must visit vacation getaway. One last note, if you expect to be connected to the internet while at Blue Waters and need Wi-Fi, request the Cove Suites, where each suite has internet access. If not, expect to connect to the net in the main lobby where they have two computers which will enable guests to pick up their emails or surf the web. Contact IPA’s travel consultant if you are interested in booking your stay at Blue Water’s.